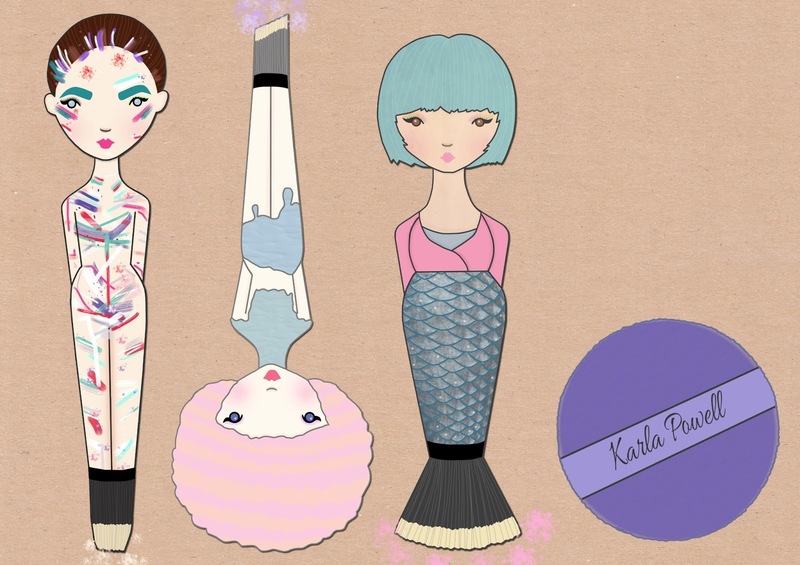 Carly Watts Art & Illustration: Karla Powell! Hey guys! I hope you are all having a good week so far. A little while ago, the lovely Karla Powell got in touch with me and asked if I would like to create an illustration based on her work, and of course I said yes! Karla is a really talented make-up artist who has a fantastic portfolio - I just love the diversity of her looks. I decided to take inspiration from a couple of her looks, but I decided to turn the models into make-up brushes! I'm really happy with how each one turned out. I did take a little artistic licence because I decided to add a little mermaid tail to one of them (I just thought the shape of the brush was a little like a tail!). I have linked all of the images below that I was inspired by. Food Inspired Make-up and hair project. If you would like to get in contact with Karla or view her blog/portfolio, please click here! wow i love this! especially the mermaid brush!! You're an incredible artist! Beautiful! This is such amazing body art, I love it <3. Her portfolio is sick, she rally is talented! !